The first thing that struck Miss Chia Hiong Hiong when she entered the Management Development Institute of Singapore (MDIS) was how she had to pick different clothes to wear every single day. 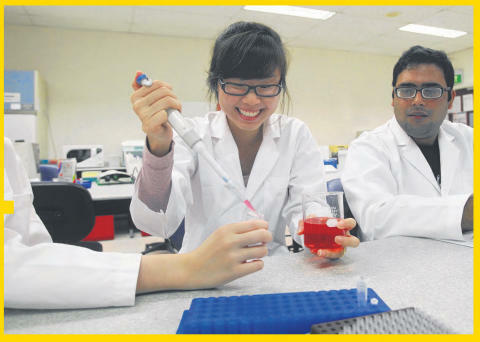 The 19-year-old, who is doing the Foundation in Biomedical Sciences course at MDIS, said entering a private school means you have to make more choices on your own. It may be a whole new world for new students entering MDIS, but Miss Chia said they get a lot of guidance from the lecturers and other staff. She takes us on a journey of what her typical day is like at the school. Miss Chia first makes a stop at the Student Resource Centre at the MDIS campus on Stirling Road. “Here is where we collect new books for new modules.We have six books per term for this course,” she said. 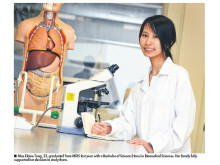 She started the six-month course in August last year and will finish it next month. She takes six modules per term and she is now in her second term. After that, she heads for the library to meet her classmates to discuss homework. “It’s always easier to discuss stuff with classmates to clarify any doubts wemight have,” she said. Since she has a bit of time just before her lab lesson, she heads down to the Kopitiam foodcourt for a quick lunch. She takes her Kopitiam card which was issued to her when she started school. “Students get a 20 per cent discount when they eat at Kopitiam. We can also use the card at other Kopitiam outlets in Singapore and enjoy a 10 per cent discount,” she said. After lunch, she rushes off to Block G for her three-hour molecular cell biology laboratory lesson, where she and her classmates make copies of a strain of DNA which they extracted in a previous lesson. 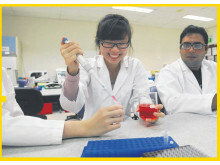 Source:[The New Paper 09012012] © Singapore Press Holdings Limited.